Farm to school enriches the connection communities have with fresh, healthy food and local food producers by changing food purchasing and education practices throughout the school, and early care and education sites. School gardens: Students engage in hands-on learning through gardening, serving school garden produce in the cafeteria, and more. School food is so much more than just food on a tray. When we talk about school food we are touching on agriculture and economic development, public health and equity, community building and cooperation around achieving shared goals. We are educating a generation of eaters and gardeners (farmers and food professionals, too), and we are providing these young people with tools and resources to feed and educate themselves and their communities. Identify menu items that you would like to transition to Washington grown products. Find a farmer or distributor to connect you to Washington grown items. Plan a local meal event. Determine training needs to assist food service staff with incorporating farm fresh items in meals. Bring a chef into the classroom. Plan a farm field trip or host a tasting event featuring local produce. Serve foods from your school garden or other community sources. The USDA Pilot Program for Unprocessed Fruits and Vegetables is one way to increase local purchasing in your school district. Visit the USDA website or read more about the pilot program in Washington here. 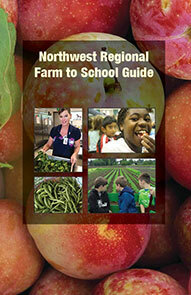 Northwest Washington - The Northwest Regional Farm to School Guide from Whatcom Farm to School is loaded with valuable information for schools in Island, San Juan, Skagit, and Whatcom counties that are making farm to school work. This guide is for parents, teachers, administrators, food service staff, school board members, and community organizations. Central Washington - The Central WA Regional Farm to School Guide is loaded with valuable information for schools in Chelan, Grant, Kittitas, and Okanogan counties that are making farm to school work. This guide is for parents, teachers, administrators, food service staff, school board members, and community organizations. It will help you connect with others who are committed to the same vision – the health of our kids and our communities.